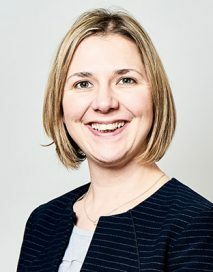 Jennie specialises in all aspects of public law work, regularly appearing in both County Court and High Court matters. Experienced in representing the Local Authority, parents (both directly and through the Official Solicitor), extended family, intervenors and Children’s Guardians. Takes a particular interest in representing vulnerable adults. Experienced in Court of Protection matters. Experienced in both the County Court and High Court representing parents, extended family and Rule 9.5 Guardians. Covers all private law applications at all stages. Regularly appears in cases involving allegations of domestic violence and sexual and physical abuse. Recently concluded a High Court matter involving complex foreign domicile and jurisdictional issues. Conducts all stages of ancillary relief proceedings in both the County Court and the High Court representing both publicly and privately-funded clients. Has experience of high net worth cases, analysis of business accounts and agricultural/farming issues. High Court cases have included foreign domicile and jurisdictional issues, freezing/Mareva injunctions and hidden assets. Regularly advises and represents in TOLATA claims and claims under Schedule 1 of the Children Act 1989.